Before each meal Captain William W. Jacobsen Jr. (BS ’98) would pause to pray. “It didn’t bother him where he was,” his wife Riikka explains. 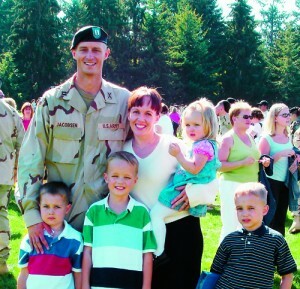 “Bill just closed his eyes and said a little prayer.” Jacobsen’s dedication to his religion set him apart from many of his fellow soldiers in Iraq. Captain Jacobsen had been stationed at Forward Operating Base Marez in Mosul, Iraq, for almost three months when, on December 21, a bomb exploded in the mess tent, killing Jacobsen and 21 others. Later investigations determined the attack was the work of a suicide bomber. Capt. Bill Jacobsen enjoys some time with his wife Riikka and their children in September 2004. Jacobsen was the highest ranking officer killed on Dec. 21 in Mosul, Iraq. Photo courtesy Riikka Jacobsen. Jacobsen attended Western Kentucky University for a year before serving a mission to Dallas, Texas, where he and Riikka met. “He was my district leader twice,” remembers Riikka. She returned home six months before he did, and they stayed in contact through letters until he came home. Jacobsen began attending BYU in the fall of 1995, and Riikka was accepted for the following winter semester. They married that December. Sadly, Jacobsen was killed on their ninth wedding anniversary.